The universe has answered my plea. I was, you will recall, complaining about the lack of fine chocolate available to purchase where I live. There is still very little variety, but I did happen on a good find. I am in Prescott quite often; while there, I ducked into a candy store seeking a lollipop (I've been obsessed with lollipops lately for some reason). Well, it isn't so much a candy store as a praline store, but I have learnt not to buy the chocolate products they make themselves. And it was there that I found a few pleasant looking bars from Vintage Plantations. I glanced at the ingredients (just the cocoa beans, cocoa butter, and sugar) and decided to take a nice plain, dark one--the 90%. If the 90% was good, I figured the brand would be good: there's no chocolate test like the very dark chocolate test. If a brand can't pull off a dark, dark chocolate and still keep in good flavor and texture, then that brand just isn't on par. As it turns out, Vintage Plantations sounds like just what a chocolate company should be. The company began in 1997 from the observations and plans of Pierrick Chouard and Allen Suarez. They wanted to bring back focus on the quality and flavor of cocoa beans instead of just volume, and they wanted to work directly with the plantations and farmers. Vintage Plantations was the first chocolate company to be part of the Rainforest Alliance. 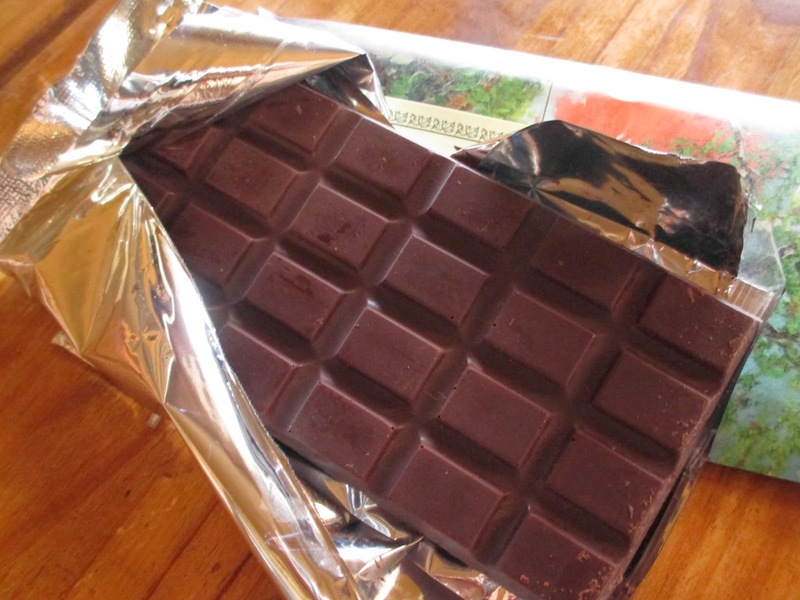 The chocolate used to be made in Ecuador, but the company had to move production over to the U.S. in 2008. Everything up to the pre-grinding, however, takes place in the country where the cocoa was grown. If you'd like to read up more, I'd highly recommend the articles on their website. Although the text could use a bit of grammar type of editing, it's full of good information. I particularly like that their tasting steps include Your Opinion. That's what I'm always trying to explain: there are certain traits of better and lesser chocolate, but ultimately the best kind is the kind you enjoy the most. If I understand correctly, Vintage Plantations sources their beans in Ecuador, Peru, and Nicaragua. So. You've already seen the pretty wrapper. The painting is by Charlotta Janssen; if you look closely, you can see that the bottom half shows cacao trees growing. 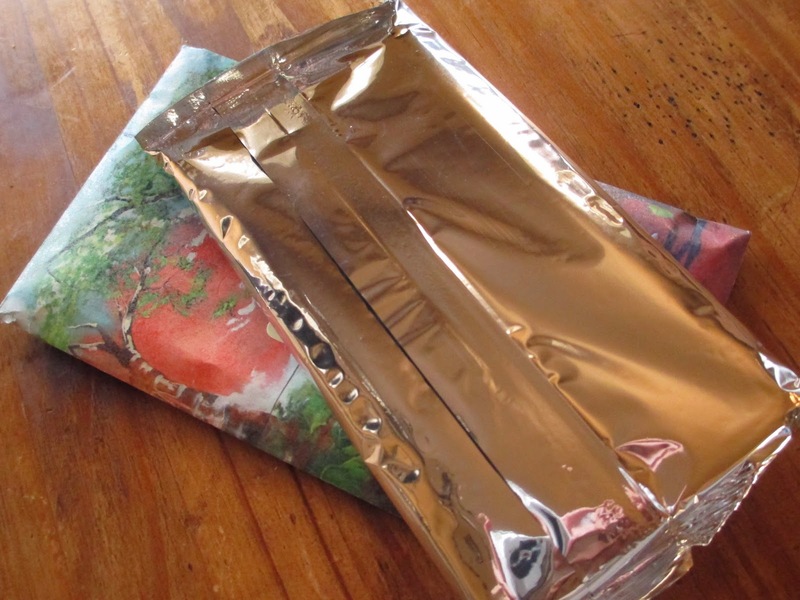 Inside the paper envelope is a sealed wrapper that protects the chocolate. Mine had a very thin coating of bloom, but that's nothing out of the ordinary for a 90% chocolate bar that was sitting in a random candy store in Arizona. Other than that, it looks good. Nice reddish color and molding, along with perfectly sized pieces. After I break off one piece, I like to put it in my mouth and give it two soft chews. You definitely want to let the chocolate melt, but sometimes a soft chew or so helps, especially with a very dark chocolate. Guittard's 91% bar (the Nocturne) is probably one of my favorite chocolates and I've sampled at least three different 100% bars, so I'm not coming to Vintage Plantations with no experience in darkness. What I've noticed is that it isn't just flavor that's difficult to get right. We all expect a chocolate with this high of a cocoa content to be bitter; we're prepared for that possibility. Texture is the one, I think, less people think about beforehand. If you don't have a careful chocolate making process down, the texture suffers. Lindt can't handle very dark chocolate: their 99% bar feels like it's almost falling apart in your mouth, rather than simply melting. Vintage Plantations handles it all better. For all my talk about experience, I do usually have to have a piece or two to get my mouth used to the chocolate and akin to any bit of bitterness; it reminds me of taking a first sip of a mixed drink, where all you can taste is the alcohol, and then by the second sip you can appreciate all the flavors. This bar's aroma is blue, like cacao nibs. In fact, the first taste was like putting a few nibs into my mouth. It definitely felt bitter. But by the second or third piece, the bitterness faded and I was left with luxurious chocolate slowly melting in my mouth. The texture is just a tad on the dusty side, not quite as smooth as some chocolates of this percentage that I've had; I wouldn't, however, consider this an issue. Instead of the bitterness on my tongue, I was ending up with just the slightest bite on the edges of the flavor, which became increasingly warm and red. The heart of the chocolate, that last lump left before it melts all away, is soothing and soft. It leaves you with a gorgeous richness in your mouth that is terribly enchanting. Take me away, my dear; I'll go where you go (I'm mimicking the lyrics to "My Reason" by Keedie). Although I paid $6 for this bar, it's $4.95 online straight from Vintage Plantations. Do note, that's five or six dollars for a 100 gram, good quality, bean to bar chocolate. Definitely not the most expensive chocolate out there. I don't know if Vintage Plantations is my absolute favorite chocolate company, but I am very glad to have made their acquaintance and am enjoying this bar. I may return to the shop to buy the other varieties.